FAQ Equisense - How do I fasten the attachment to a belly guard girth? 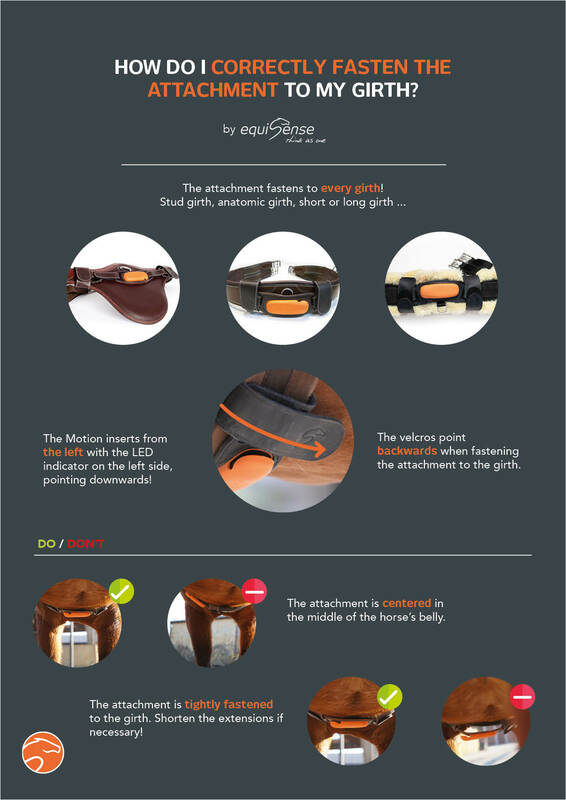 All Categories ​>​ First steps with Equisense Motion ​>​ How do I fasten the attachment to a belly guard girth? How do I fasten the attachment to a belly guard girth? To easily assemble and fasten the attachment, we've marked the different parts with L (Left) and R (Right) indications which you can refer to. Make sure to respect these indications to correctly fasten the attachment to your belly guard girth. Once the attachment is assembled, fasten it to your girth using the Velcro. The Velcro must be pointed towards the exterior and the back of the horse: ensure that the orange protection case is correctly centered and securely attached to the girth. How do I fasten the attachment to my girth? How do I put the sensor into operation? Does the Motion fit to all girths?